*I received a free 3 month membership of Book of the Month to facilitate my review and am also an affiliate marketer with them , as well. All opinions here are my own. As a mom and avid reader, I am always on the lookout for new and fun ways to get my reading on. Granted I very often read ebooks as it is just easier to get my hands on them being a mom with limited time to go shopping. But I still do love the feel of an actual physical book as nothing truly compares. But I think most who frequent my blog know that this mom just loves to simply read. So it stands to reason that recently, I kept seeing Book of the Month come up on my Facebook feed. Apparently Facebook, even knows I love to read. I finally decided to click through to get more information. I couldn’t have been happier to learn more about Book of the Month. It is a virtual book club in nature, where each month a panel of Judges select a limited number of exceptional books to offer to members. Then they announce their new selections on the first of the month. Once they do, members have six days to decide which book (or books) they would like to receive. After the 6th day, they ship books to all members at the same time, so members can read and participate in their discussion forum as a group. How much does Book of the Month Cost? How do you join Book of the Month? Just click on the “Get Started” button on BookoftheMonth.com. You will then be asked to submit your name, email address, select a membership plan and also fill out your billing and shipping information. And that’s how simple it is! What about Book of the Month’s return policy? They accept returns of damaged or defective books up to 30 days from the date of shipment for replacement or box selection credit; but no refunds. If you return a damaged book, we will send you a replacement copy or if a replacement copy is not available, one box selection credit will be applied to your Book of the Month membership account. So, now that you are armed with all the details of Book of the Month, I know you must be dying to know what my first month’s book was. 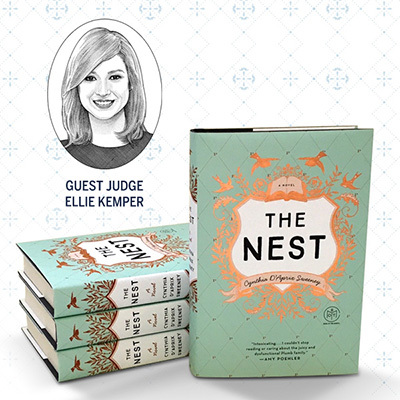 Well, I couldn’t resist guest judge’s Ellie Kemper’s selection of The Nest by Cynthia D’Aprix Sweeney after reading her reading her brief, but light hearted summary. Plus, I just adore her on the Netflix hit, The Unbreakable Kimmy Schmidt. A sibling and family story at the heart and central core of this book, which from all the descriptions I read had me truly excited to read. It revolves around that of the four Plumb siblings. As I began, the grand question that most readers seemed posed with was that of which sibling most the most likable and empathetic. To be fair and honest, I could see each and every having their good and bad. So, for me, I had moments where I liked and then also hated all four. Definitely, then a love/hate relationship with all four characters throughout the book. See the overall plot, revolves around the title, “The Nest”, because years back the siblings father, who has long since passed on, set up a trust fund for all of his four kids. He meant for it to be a small amount and not a huge inheritance by any means. But it was invested wisely and “The Nest” grew substitutionally with the kids standing to inherit a truly large sum of money each. But as the date was to approach for them to take possession of their share of “The Nest”, the eldest sibling, Leo, got into a scandalous accident. A large portion of The Nest, therefore had to be used to bail him out of this mess. The siblings’ mother made this ultimate decision to squash the ensuing embarrassment she felt would come of Leo’s incident. The siblings, therefore, went along with this, but begrudgingly. The story takes off from there, where we are introduced to each dysfunctional sibling and how each could ultimately benefit from Leo paying back the money that he had to squander by borrowing against “The Nest”. We also get to find out about what makes Leo tick and just when you think you are getting to indeed know him, you find out there is much more to his story than meets the eye. While this was definitely a fun and an easy read, it still left me wanting more as I continued to read as each siblings story while independent in their own nature bringing depth to this novel, but somehow interwoven, as well. Also, this book was not without irony or light humor and had a good far of family drama at its core. My overall assessment is that this one is a must have for the upcoming summer, beach reading list this year. Are you a Book of the Month member? You know I love my books! This is the perfect Mother’s Day gift! Great suggestion for a Mother’s Day gift. All moms need to take a few minutes each day to escape and relax from the daily business of life. My mother in law may enjoy this too. She lost my father in law last Nov and gets pretty bored. Thanks for the suggestion. The book of the month club sounds like fun to me! What a great idea! Bev listens to audio books, but no doubt they have those as well, right? Anyway, thanks for the idea and Happy Wednesday to you, Janine. Brilliant! Also that book sounds great! Truly, I love this idea, but I wish I would be able to get through a book a month. This year, I’ve completed three books, which is way more than I have in a long time. Great idea. I like having a reason to read. I’m in a book group and this has led me to read many books I never would have picked up on my own. I also like reading what others are reading so we can talk about it. That’s the fun part for me! What a cool gift idea. I’m from a long line of intense readers. And now Scarlet is following in those footsteps! I know THIS mother would love a gift like this! What a great gift idea! I’m more of a library gal, but I will definitely keep this in mind for some of my fellow readers! And thanks for a review of The Nest – that’s one I’ve been seeing all over the place. I totally think you would!!! I want this gift! AMAZING! I would LOVE the Book of the Month for a gift and your review of the Nest makes me want to read it. I must read Flight of Dreams soon too! Thanks for sharing, I’ve been hearing about this in my Facebook feed lately. Tanya, you are so welcome and again same with hearing about it originally in my Facebook feed, too. You? Like to read? HAHAHA. I know and have known this since day 1. Hehe. This would make a great Mother’s Day gift, for sure! What a neat idea for doing book clubs, too. This is a neat idea. I’m spoiled by e-reading on large font so I don’t have to wear my glasses. The last book i checked out from the library I got in the large print edition. That’s a great way to do a book club and another way to meet people you wouldn’t have met otherwise. You’ll have to let us know how the discussions go. Book of the month club membership as a gift? Why haven’t I ever thought of that before. That is absolutely perfect. Thank you! Fabulous post and you are a natural at this my friend! The books sound great and I’ve clicked over to check them out too. Thanks for the gift gifting idea, it will be very appreciated!!! They totally picked the right person for this! I love this service because honestly it is so hard keeping up with all the new great titles and my favorite way to read is with a hardcover book!! The price is pretty awesome too considering how much hardcover books costs these days. Sure beats the heck out of the concept of the Mother’s Day Soccer Shootout tournament weekend for moms! I love the idea of books for a mom, by the way. Here’s to some you time, Janine, with one of these great books. Rum and Coke optional. Such a perfect Mother’s Day gift, Janine!!! Love it!! I remember you were intentionally reading more. That inspired me to want to create a similar goal, but then I got into overdrive in my life and haven’t had time. It’s still on my back burner though. A BOM club would be awesome (bet my mom would like it too, lol!!!). Sounds like a very interesting subscription and I wish we have a similar thing like that here too. Currently, I am enjoying browsing through the titles of our national book store though. Haven’t bought one in about a month so I think it’s about time. What a great idea for a present! I should look into this for my mom — I got my love of reading from her! Summer starts in exactly in 25 days and I am ready for some summer reading! Thank you for introducing me to this book of the month club and for reviewing the Nest. I am happy you liked it, because I saw it last week at a local book store and wondered about it. 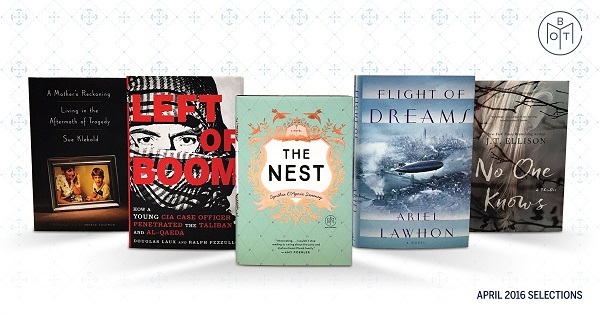 I ordered The Nest from Audible, based on your GR review. Can’t wait to start it. What a fun gift idea! My MIL is an avid reader, so she would probably love this. And I’ve been looking for a good, light read for the summer. Thanks for the review!